What the blank makes quantum dots blink? (Nanowerk News) Quantum dots are nanoparticles of semiconductor that can be tuned to glow in a rainbow of colors. Since their discovery in the 1980s, these remarkable nanoparticles have held out tantalizing prospects for all kinds of new technologies, ranging from paint-on lighting materials and solar cells to quantum computer chips, biological markers, and even lasers and communications technologies. But there’s a problem: Quantum dots often blink. This “fluorescence intermittency,” as scientists call it, has put a damper on many potential applications. Lasers and logic gates won’t work very well with iffy light sources. Quantum dots can absorb specific colors of light, too, but using them to harvest sunlight in photovoltaics is not yet very efficient, due in part to the mechanisms behind blinking. 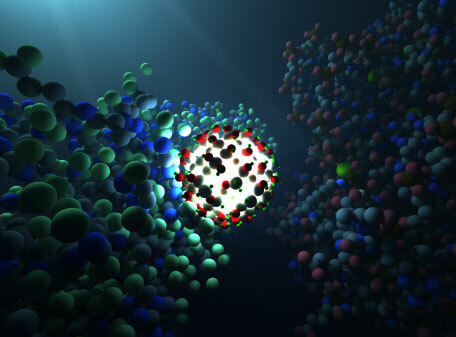 University of Chicago scientists computing at the Department of Energy’s National Energy Research Scientific Computing Center (NERSC) recently probed the mysterious blinking process in silicon quantum dots using simulations. Their results, published in the February 28 issue of Nanoscale ("Surface dangling bonds are a cause of B-type blinking in Si nanoparticles"), bring scientists a step closer to understanding—and possibly remediating—the problem. Quantum dots—known variously as nanocrystals, nanoparticles and nanodots—posses some beneficial properties that their bulk counterparts lack. Excite a quantum dot and it glows brightly in a specific color of light. Vary the width by a few atoms and you can tune it to glow different colors: The smaller the dot, the bluer the light. The larger the dot, the redder. Quantum dots can likewise be tuned to absorb specific wavelengths of light, a useful property for solar cells. In comparison, the molecular structure of bulk semiconductors determines (and limits) the colors of light (or energies) emitted and absorbed. So, a light-emitting diode (LED) made of one material may glow green while another glows red. To get different colors, you must use different materials. Solar cells, likewise, use layers of different materials to capture various wavelengths of light. So, why does a nanocrystal of semiconductor behave so differently than a larger lattice of the same material? In a word: size. Artificially fabricated to contain just a handful of atoms, quantum dots are so small that they exist in the twilight zone between Newtonian and quantum physics, sometimes obeying one set of rules, sometimes the other, often to surprising effect. While the crystals of bulk semiconductors can lose and regain electrons (that’s how they conduct a charge) the electrons of a quantum dot are confined within the dot. This state is called quantum confinement. When the electrons of a quantum dot interact with light, they can undergo a transition and "jump" (quantum-mechanically) to a state that under normal conditions is unoccupied. The energy associated with the smallest jump is called the gap. The gap is thus the excess energy that electrons can shed, ideally as light (or in the case of photovoltaics, carriers) when snapping down to a lower energy state. As a result, the radius of the material defines the energy these dots can absorb and emit. Quantum dots, however, tend to blink on and off. The blinking isn’t random (it obeys a “power law”), but it also isn’t predictable. Thus, individual particles might go dark only for nanoseconds or remain dark for minutes at a time or some interval in between. Scientists have some ideas about what causes the blinking, but still don’t understand exactly how it works, said Marton Vörös, a University of Chicago postdoctoral researcher who coauthored the study. To study blinking, the team used simulated silicon (Si) nanoparticles configured with various defects and coated with silicon dioxide. Starting with three different possible defect states, they used the Hopper supercomputer (a Cray XE6) to calculate the optical and electronic properties of the oxidized silicon nanoparticle with the scientific package called Quantum Espresso. To perform their calculations, the team first constructed virtual models. They computationally carved virtual holes out of a crystalline silicon oxide (SiO2) matrix and inserted silicon quantum dots of various sizes, computing cycles of annealing and cooling to create a more realistic interface between the quantum dots and the SiO2 matrix. Finally, dangling bond defects were introduced at the surface of quantum dots by removing a few selected atoms. By computing the electronic properties and the rate at which electrons release energy, they found that trapped states do indeed cause quantum dot dimming. Dangling bonds on the surface of silicon nanoparticles trapped electrons where they recombined “non-radiatively” by releasing heat. That is, the electrons shed excess energy without radiating light. But it was a little more complicated than that. 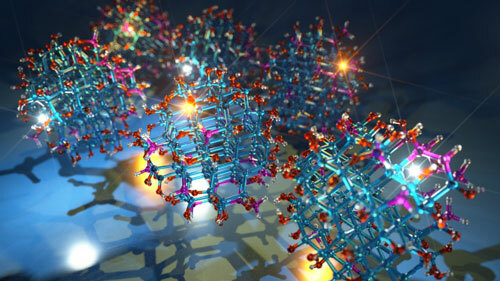 Dimming also depended on the overall charge of the entire quantum dot, the team found. Sometimes an electron can get trapped in the material a dot is embedded in, silica in this case, giving the dot an overall positive charge. Only when the electron remains trapped on the surface of the nanodot, making it neutral or negatively charged would it decay without radiating light. “So, when the dot is positively charged, it will be bright. When it’s neutral or negatively charged, we expect it would be dark,” said Nicholas P. Brawand, a University of Chicago graduate student who coauthored the study. “Now that we’ve tested this technique, we can apply it to nanocrystal solar cells, too,” Galli said.